EU WITHOUT UK; WHAT DOES IT MEAN TO IPOB?...VICTORY IS CLOSE AND BIAFRAN FLAG MUST BE RAISED UP! Biafra and Britain, two titans, whose enmity can be traced back to as far as the 1700s. Biafra was a place Britain came in contact with a very different breed of blacks who not only resisted every form of change, but questioned their intentions. As a result, relationship between these two has been hostile and haughty. Britain’s impact on Biafra is best described as a ‘’Pay-Back Model’’; for opposing the Western system of government, for resisting slavery, for defying their orders, for challenging their edict and showing to be equal with the Whites. This is contrary to the way they were accepted in the Northern and Western part of today Nigeria; where free born is delivered to them as slaves, Western governance was easily instituted and they (the Whites) were highly esteemed. In response to the situation, Britain made sure that Nigeria was structured to their perpetual benefit. Ever since the ill-fated amalgamation took place in 1914, Britain had more grip on Biafra, and ensured that Nigeria was structured to suit their loyals. In Emeka Ojukwu’s words, ‘’Nigeria is indeed a very wicked and corrupt country in spite of the glorious image given her in the European press. We know why Nigeria was given that image. It was her reward for serving the economic and political interests of her European masters. "Nigeria is a stooge of Europe. Her independence was and is a lie. Even her Prime Minister was a Knight of the British Empire! But worse than her total subservience to foreign political and economic interests, Nigeria committed many crimes against her nationals which in the end made complete nonsense of her claim to unity. Nigeria persecuted and slaughtered her minorities; Nigerian justice was a farce; her elections, her census, her politics - her everything - was corrupt. Qualification, merit and experience were discounted in public service. "In one area of Nigeria, for instance, they preferred to turn a nurse who had worked for five years into a doctor rather then employ a qualified doctor from another part of Nigeria; barely literate clerks were made Permanent Secretaries; a university Vice-Chancellor was sacked because he belonged to the wrong tribe. Nigeria was a classic example of a neo-colonialist state, and what is left of it, still is. The militant nationalism of the late forties and early fifties had caught the British imperialists unawares. "They hurried to accommodate it by installing the ignorant, decadent and feudalistic Hausa-Fulani oligarchy in power. For the British, the credentials of the Hausa-Fulani were that not having emerged from the Middle Ages they knew nothing about the modern state and the powerful forces that now rule men’s minds. Owing their position to the British, they were servile and submissive. The result was that while Nigerians lived in the illusion of independence, they were still in fact being ruled from Number 10 Downing Street. The British still enjoyed a stranglehold on their economy." Aburi accord, reached between 4th and 5th of January 1967 by both Nigeria and Biafra delegates would have arrested this already ugly situation and saved the lives of millions. But no! Britain made sure that Nigeria disregarded the agreement in order to preserve their control over Biafra and her resources. Still in pursuit of a better society and freedom connatural to an average Biafran and following the pogroms against Biafra citizens, Sir Emeka Ojukwu in agreement with other Biafra elites embarked on ‘’Biafra Revolution’’. In his words, ‘’Our Revolution is a historic opportunity given to us to establish a just society; to revive the dignity of our people at home and the dignity of the Black-man in the world. We realise that in order to achieve those ends we must remove those weaknesses in our institutions and organisations and those disabilities in foreign relations which have tended to degrade this dignity. This means that we must reject Nigerianism in all its guises’’. At this, Nigeria, aided by the world powers, declared war against Biafra and fought with all their might for a three and half year. The war ended only on paper, Biafra has never had her peace. Coming in contact with Britain has turned to be the nation’s greatest woe. In recent times, several groups agitating for the restoration of this ancient city have emerged, and it is expected that the major world bodies like the EU and UN should give it the required attention for desirable outcome to be achieved. Again, Britain, wielding far much influence in EU than any other member country has frustrated the necessity of Biafra restoration in the union and damped the voices of Biafra allies like France, Spain, Portugal, Italy and Norway. With the recent calls for restoration, Biafra has amassed even more allies than she had in the 1960s. 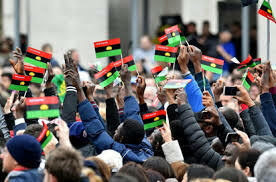 There is no doubt that UK’s exit from the EU will allow for more objective approach towards Biafra restoration by EU, which includes referendum vote. Countries like France and Spain in particular are likely to be on the forefront of this project. They will like to show Britain’s zero influence on EU and her decisions henceforth. The waves are already seen on some socio-economic measures in the continent. More to this, Brexit has further emboldened not only Biafrans but other agitating countries like Northern Ireland, Scotland and Hong Kong to call for referendum also. This time, it will be twice difficult for Britain to forestall the struggle. I wonder how Britain forgot the ‘’territorial intergrity’’ of the EU as she requested to leave, they forgot the story of South Sudan, they forgot about the second world war –these stories seem to be fit only for Biafra agitators, where we are reminded of the civil war and sovereignty of Nigeria. Ojukwu best described this in his speech when he said, ‘’The right to self-determination was good for the Greeks in 1822, for the Belgians in 1830, and for the Central and Eastern Europeans and the Irish at the end of the First World War. Yet it is not good for Biafrans because we are black. When blacks claim that right, they are warned against dangers trumped up by the imperialists - “fragmentation” and “Balkanization”, as if the trouble with the Balkans is the result of the application of the principle of self-determination. Were the Balkans a healthier place before they emerged from the ruins of the Ottoman Empire?’’. Today’s EU, void of Britain and her diabolic manipulations, can make and execute her plans in best practices. EU without this Sodom of Europe means HOPE FOR BIAFRA, it is a thrust to Biafra restoration as our flag is about to be raised up. Biafrans are happy, that at last, EU has been delivered from the subjection and oppression of Britain. Biafra shall come to be. I can't wait any longer. Each day I surf the net and listen to discussions to know if Biafra is tomorrow. I love Biafra my father land.